That module comes already on a carrier, so I assumed I can use the same driver as for my other module. I was wrong :-(. The HC-05 has the ‘full’ firmware on it: many AT commands, and can be both master and slave module. The HC-06 firmware on the other hand only can be a slave device, with very limited AT commands. For most use cases the HC-06 is enough, as typically I want to have a wireless UART connection to my devices from my notebook. KEY: according to the data sheet, I need to pull-up this pin while power-on-reset of the module to enforce AT mode. I have not been able to verify this yet. I have been told that some modules have this pin not connected at all? VCC is indicated in the range of 3.6V-6V. The module worked for me both with 3.3V and 5V. RXD: serial input of the module, to be connected to the TX of the microcontroller. Note that this signal is using 3.3V logic levels. 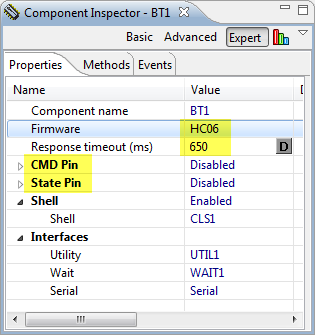 STATE: connected to LED2 (Pin32) of the module, but no meaning? At least on my module the pin was always low, regardless if paired or not. On the HC-05 module, I send “AT\r\n” to the device, and then it responds with “OK\r\n”. But on the HC-06, the protocol is different 😦 I need to send “AT” (without the new-line characters), and I receive “OK” (without the new-line characters). So for this I had to introduce a user configurable delay in the component. With this, I can change the pairing pin, device name or baud, beside of sending AT commands or sending a string over the wireless bridge. 💡 Changing the pairing/name/baud will be effective after resetting the device. Keep in mind if you change the baud, this will change the baud as well between the module and the microcontroller. ❗ Status and AT commands can only be used if the device is not paired yet (means: while the red LED is blinking). 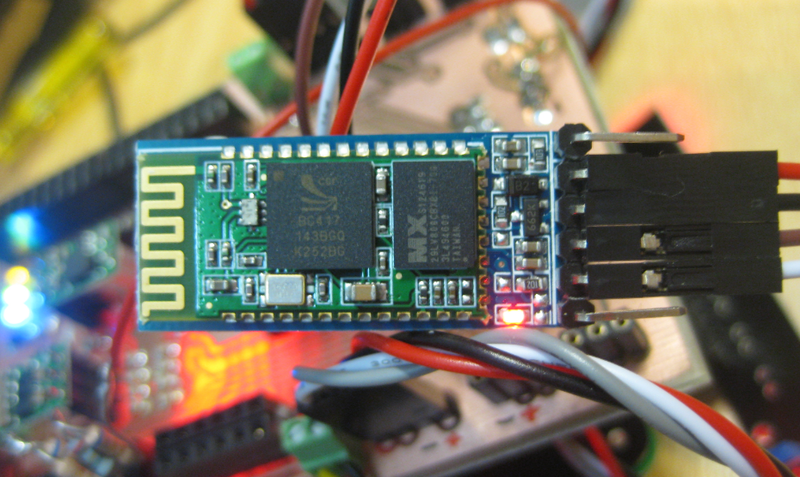 The Bluetooth module runs the SPP (Serial Protocol over Bluetooth) protocol. So any device supporting SPP can connect to it. On a PC this looks like a virtual COM port. 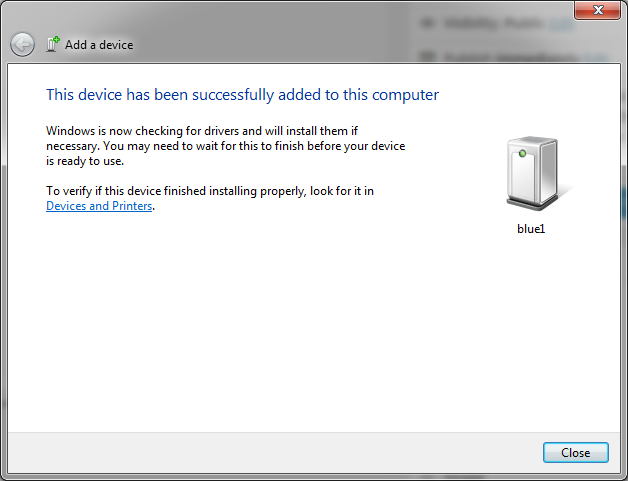 I show here the steps for Windows (running Windows 7). ❗ It seems that Apple (iPhone, iPAD, etc) does *not* support SPP, so connecting with an iPhone is not possible. 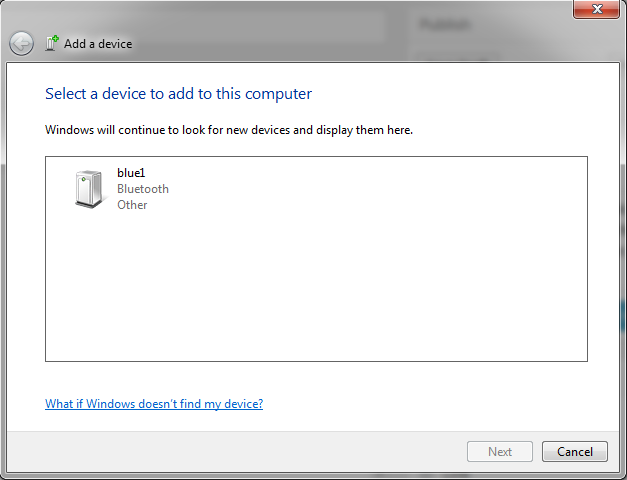 Android (which I did not try) should work, or any PC machine with Bluetooth. 💡 the name of the device shows here for me ‘blue1’, as I have named it as such. But it might show up for you as ‘linvor’ (default) or ‘other’. 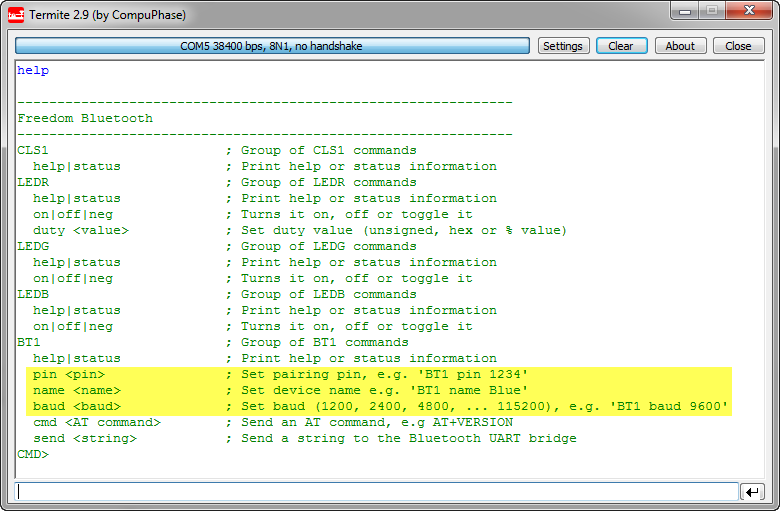 ❗ Note that if I check the COM ports in the device manager, then I see that actually two COM ports have been added. Only the one shown above with the SPP protocol will work. It is unclear to me why there is a second port? ❗ Make sure you use the COM port used for the SPP service, and that it matches the baud settings of the communication between the microcontroller and the Bluetooth module. I’m using above the default of 9600 baud. It is possible to change/increase the baud as explained above, as 9600 is not very fast. Only be sure that you not exceed the baud to a value which cannot be handled by your PC. It should work ok up to a baud of 115200. 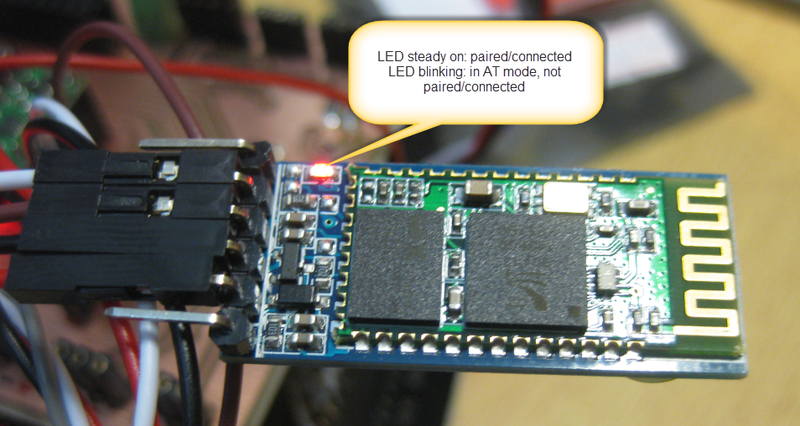 Once connected, the red LED on the Bluetooth module is always on. 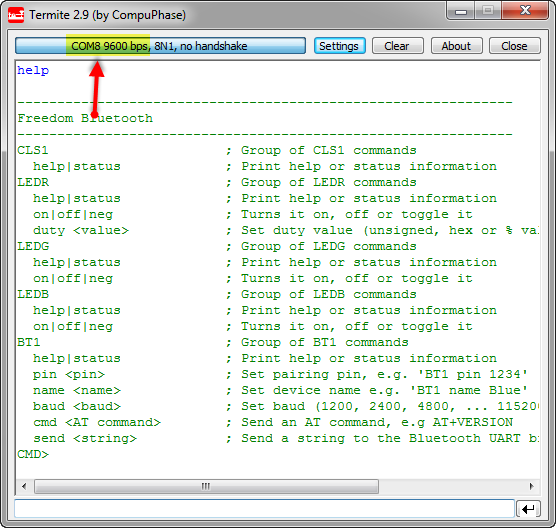 Close any terminal program potentially connected to the Bluetooth virtual COM port. 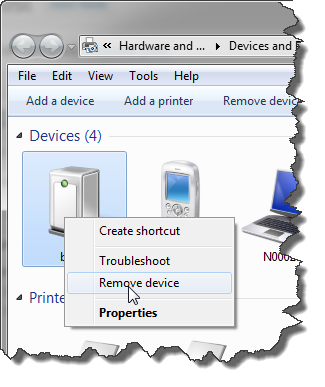 Unpower the Bluetooth module so it is not visible any more to the PC. Re-power the module: the red LED shall be blinking as not connected. 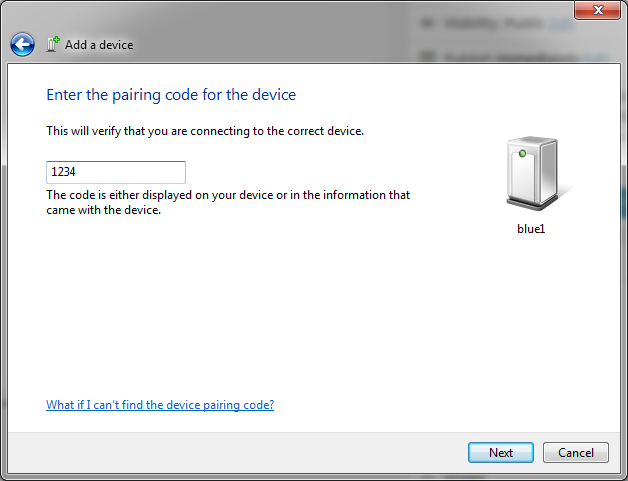 Search for the device in the device manager (as above), and connect again to the device with a pairing pin. 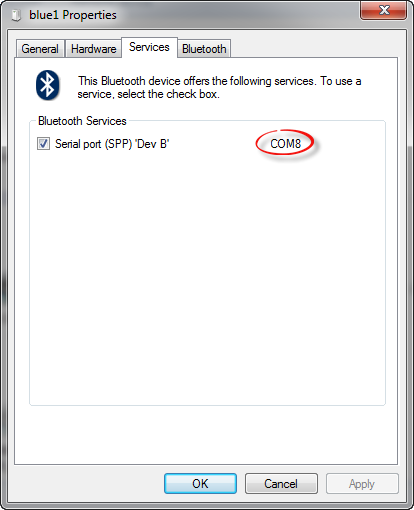 Connect to the module using the COM port specified for the SPP service. That way I was always able to recover connection to my module. See as well this post which helped me to solve my problem. All the component sources discussed are available on GitHub. Additionally, the FRDM-KL25Z Bluetooth example project has been updated to support both the HC-05 and HC-06 modules. This entry was posted in Boards, Debugging, Eclipse, Embedded, Embedded Components, KL25Z Freedom Board, Processor Expert, Tips & Tricks and tagged CodeWarrior, codewarrior project, Eclipse, Embedded Component, freedom board, KL25Z Freedom Board, open source projects, Processor Expert, software, software project, Tips&Tricks by Erich Styger. Bookmark the permalink. I learned from you a lot, thank you. I have problem with using HC06 with K64F, I don’t know how to print the receiving data on the ConsoleIO. I used components such as; AsynchroSerial, ConsoleIO, utility, CriticalSection and shell. Sorry, I have no experience in C language, I don’t know how to write a cod for calling the received data and printed on the screen! ! I followed your tutorials and I can print any text on the screen. Could you please give me hands? I’m affraid that you need some C experience to do something like what you are asking for. Like with anything, it needs patience and practice, so don’t give up learning C/C++! where AS1 is your console/terminal channel. I am currently using the HC-06 but need to have iOS compatibility. This requires BLE as supported by the newer HM-10 and HM-11. Does anyone know if the HC-06 SMD module can be replaced by the HM-10 or HM-11 without the need for PCB changes ie. drop in pin-for pin compatible and same size? Pingback: Vixen Super Polaris GoTo – dings.­..! Yes, they will look the same from that perspective. It seems rather random which commands are working and which aren’t. Another strange thing we noticed is that we can set the name of the device to only 4 characters. If we try 5, we get the same error as above. We tested it with two different firmwares (V2.0 and V2.1). Is there a possibility that there’s a buffer overflow? Or could it be that the firmware is limiting our permission to change certain settings? I recommend you hook up a logic analyzer to the Rx and Tx lines to see what the module responds. The other thought I have is that indeed it might be depending on the firmware of the modules you have. Is it possible to set response timeout less than 650ms in HC-06? I want to make the response faster. And another question is “Processor Expert Component” a free software? where can I download? yes, you can specify any time you want. But be aware: making the timout faster won’t give you a faster HC-06. I have the HC06 and Arduino Uno, The plan is to use this as a slave device to an Android phone and do the proximity check. So the HC06 will pool every 500mS for the paired device and up on master in the range the slave will trigger a digital output. Have you came across such an application? 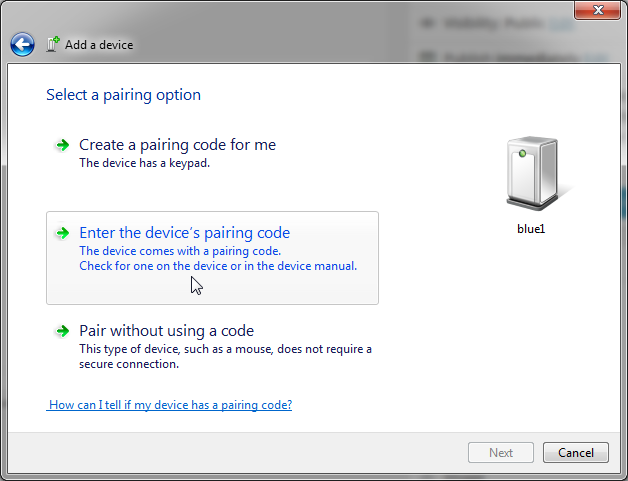 You will have to initiate a pairing from the Android phone. If this is done, then yes, you can detect that the device is paired on the Arduino: either you check the LED status with a pin or you probe the HC06 if it is still in command mode or not. Best if you use a microcontroller connected to the HC-06 over UART. Sense the motion with the microcontroller, then send a message over UART to the bluetooth module which is bonded to the Android phone. On the Android phone you need a UART/COM connection, write an app or script which reads the incoming messages and checks for that alarm message. You want to tell me that the HC-06 can use it as a master in a microcontroller ??? … because in fact I have a FREESCALE KL46Z that could use. Although it is new and I am only learning to use it. there are many different HC-06 modules, and they can have different firmware. For the AT commands, you should check the signals with a logic analyzer first. How i can make use of Programmable input/output in HC-05 or HC-06 for activate or deactivate a single LED???? the modules I have do not have that capability. You would need a moduld which have this capability, or emulate it with a micrcontroller attached to the Rx/Tx line. Great site. 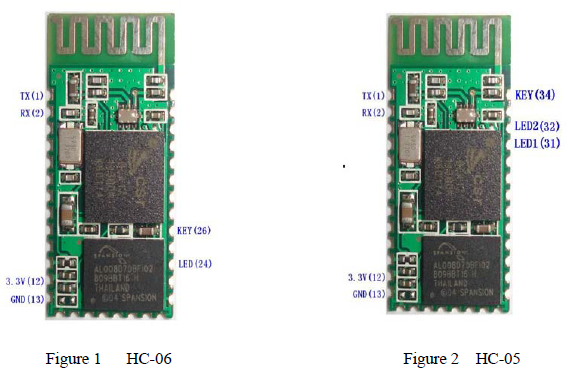 I added bluetooth to one of my old RC chargers and found this page while doing some research on HC-05 vs HC-06 modules. Kudos on a great site you’ve put together! Your old Metrowerks / Freescale colleague!